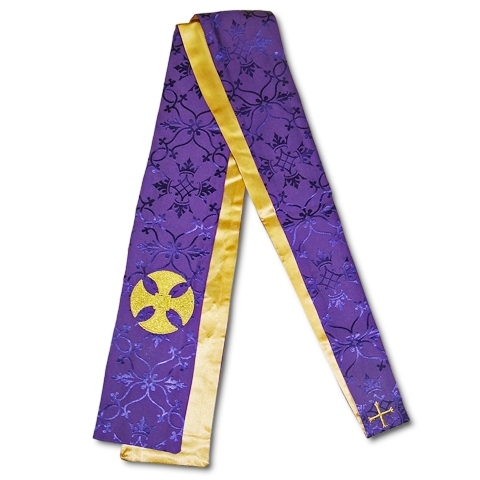 The vestments of the clergy are meant to catechize and remind us of our Lord and His passion. The Bishop and the Priest are ordained for sacrifice and minister in persona Christi capitas. This means that all the Sacraments related to sacrifice and/or the forgiveness of sins are oriented and ministered by them alone. The vestments of our ministers also teach us about their ministry and serve to draw us deeper into the Paschal Mystery of the Christ. In particular, the stole and cincture stand out when thinking about the Passion of our Lord. As we know, the stole is the symbol of a priest/bishop’s authority. A kind of kerchief or neck-piece, it was a daily piece of clothing donned by the upper class in Rome. Gradually, it was adopted and reinterpreted by the Church to represent the spiritual authority of the clergy. The bishop and priest wear the stole over their shoulders while the deacon wears it draping over his left shoulder to his right hip. This vestment also has a secondary meaning that is steeped in centuries of tradition. 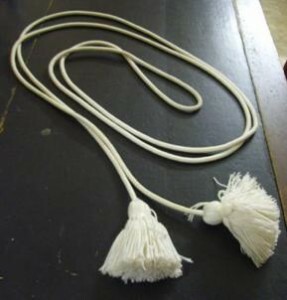 Our tradition tells us that the stole is also to remind us of the cords with which Jesus was tied. It too invokes images of the cross our Lord carried and, particularly with the bishop and priest, the yoke upon their shoulders. For the bishop and priest it is a constant symbol of the heavy burden they carry which is made light and sweet by the love of the Christ. The cincture was used out of necessity during walking and activities requiring exertion to gird up a long garment. It’s spiritual significance is that of the cords that bound our Lord to the pillar during the scourging. It is also a symbol of modesty and the readiness to work in God’s service. My favorite vestment is the Amice. The Amice, for me, seems to make more concrete the difference between the person and the ordained minister. The person is “sealed off” when the Amice is tucked in around the neck, almost making complete the putting off of the self in service of God as an ordained minister. It is as if the person wearing the Amice is cognizant of the fact that they are putting their prideful selves under wraps, allowing for God to truly be made known through the person of the ordained minister. Hmmm. Never thought out it like that. As you know, the Amice was a hood and lining for the helmet. Fr. Paul Scalia relates the Amice to the helmet of salvation. I like the idea of being “tucked away”. Lately my thoughts have been focused on the relation to JPII’s Theology of the Body and the liturgy. I am excited to see where my research goes in understanding the relation of liturgical vessels and vestments to his corpus.